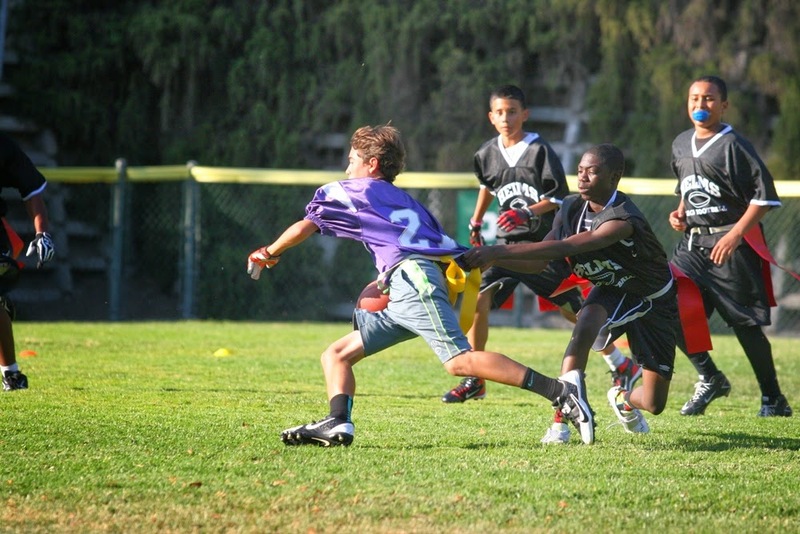 A huge and very athletic Helms Middle School flag football team from San Pablo showed up to Coaches Field Thursday looking very much capable of, and intent on, handing the Highlanders their 4th consecutive loss. The boys from PMS, however, had other ideas. In spite of going against a line that ranged from 200 to 240 lbs, and against a very fast and accurate quarterback who stood at least 6', and weighed 190 from Helms, PMS simply played big and won going away. A combination of short yardage runs, intermediate passes, and one bomb to (#3) from (QB), kept Helms playing catch up all day. 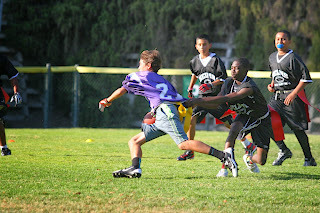 Runs like the one seen here by (#24) were the meat and potatoes of the PMS offense scheme. On defense, physics were defied as a clearly outclassed and hugely outweighed PMS line outwitted the bigger, stronger and frankly more ferocious Helms' rushing attack. Sacks were few and, given plenty of time to run its offense, the Highlanders landed their first victory 24 -12.